The Touchstone Tools: Building Your Way to an Inspired Life (“TT”) will be featured Friday July 29th at a book signing event in Ithaca, New York. TT author Joseph Holland will be at Buffalo Street Books (215 N. Cayuga St. The Dewitt Mall, Downtown Ithaca) to sign books from 5 to 7 pm. Also that weekend, Joseph will be giving the Sunday morning message at New Life Presbyterian (Cinemapolis, 120 E. Green St., Ithaca) on July 31st 9:30 am and will be available to sign books after the service. 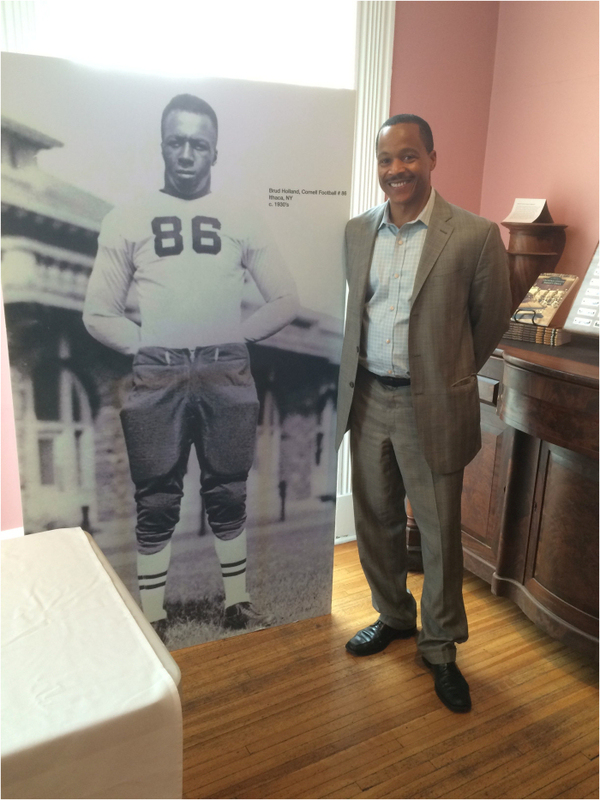 Below is the photo – from a recent TT book signing at the Cayuga Museum in Auburn, NY – of Joseph with a true to life cutout of his dad, Jerome “Brud” Holland, adapted from a photo taken during Brud’s gridiron glory days of the 1930’s. Joe played football for Cornell forty years after Brud and also attained All-American status.